Wash the limes thoroughly with dish soap and rinse well. You want to remove not only any germs but also anything that has been sprayed on them as well. Mix the sugar and water and set aside. Pour the mixture into a fine mesh colander (strainer) which you have placed over a bowl or your pitcher (if you are using one with a large enough mouth–I did not have one that would work for this step, but a bowl is fine). Press with a spoon to get the juice and tasty goodness pressed into your container. 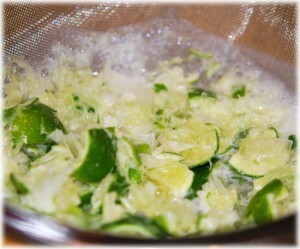 Throw the pulp left in your colander into the trash and repeat the process with the other half of the limes and sugar/water mixture. 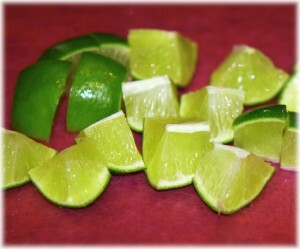 BTW if you put a FEW of the lime rinds into your garbage disposal and run it (with water!) it helps clean it and makes it smell nice. I wouldn’t recommend putting them all down there as a big glob of stuff like this can clog up your drain, but I use lemons/limes to freshen my disposal, so why waste these? 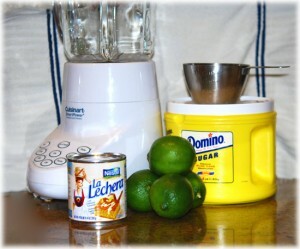 Next, add 6 tablespoons of sweetened condensed milk. I was really generous with this because of one thing, I bought the regular sized can, which is overkill and I had plenty and for another thing, can you REALLY have too much of this most awesome of foodstuffs? If you can’t have this, or don’t want to add it, I suggest you just skip this entire recipe. It’s mentioned as the secret ingredient, and I am inclined to agree more than 100%. I’m not good at math, but I think more than 100% is a lot. Then, just stir to mix it well, pour it over ice and enjoy the heck out of it! We had it with dinner last night. We both had 2 and there was some left over. I put it in a lidded glass container in the fridge and will try it again tonight. We’ll see how well it holds up. I hope it does, because it’s just too good to waste. Oh, I apologize for not having beautiful photos of it in beautiful glasses like Our Best Bites. I rummaged in my cabinets and came up with only those two mugs. But both of those have a story, so I will share those (just to make it seem like it was on purpose). One was won by one of my dogs at a Specialty Show so it means a lot to me, and the other my Mom bought. 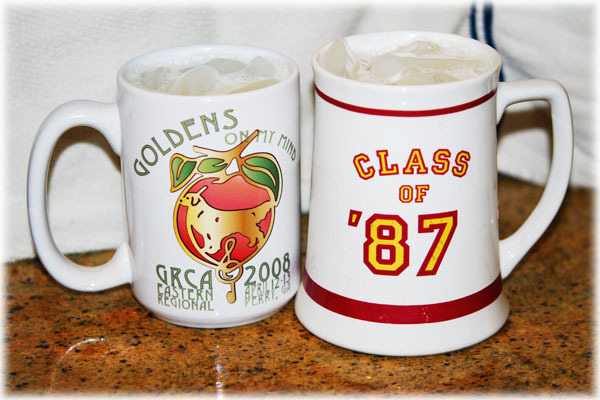 No one I know graduated in 1987, but it was on sale somewhere, and Mom loved a good sale. 🙂 So, here’s to beautiful dogs and smart shopping Moms! Bottoms up! Wow what an intriguing recipe. Definitely one to try, sounds perfect for the summer. Seems like a nice and easy recipe and one I can get the ingredients for too. Love the mugs.Who says we all have to be posh all the time!! Hugs Mrs A. Thank you for stopping by. I had envisioned it looking as lovely as it did at the original recipe, but you’re right. It still tasted heavenly! I have a Vitamix blender and put it on the “pulse” setting for twenty seconds. It came out great. I also made another batch and put it on the “high speed” setting for twenty seconds with an ice cube added to it and it came out frothy. Both versions were fabulous. Just go with your mood. As for the Splenda, if you like your lemonade tart, use 3 packets, if you like it sweeter, use 4 packets. A whirl?! LOL Thanks for stopping by Caroline. That sounds lovely, I haven’t made homemade lemonade (or Lime) since my children were small…. maybe I need to do some. 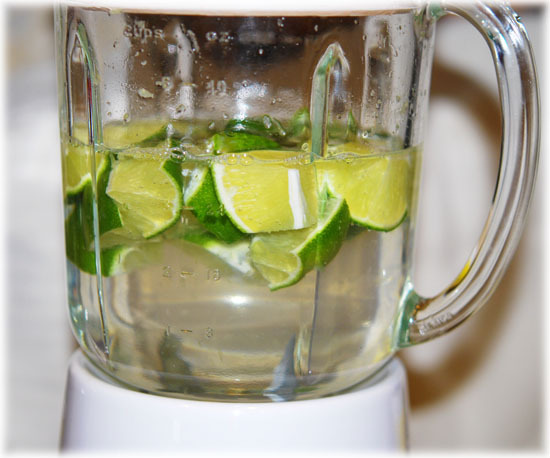 It sounds refreshing, pleasant, and I love recipes with lemon. Oh how I live near you, I think I’d be invading hihi, very attracted to your recipes! Oh I love the mug too, but mine have rather cats héhé ! I’ll have to try this one, sounds different, might be nice to take to a Relief Society gathering. About time you put up a new recipe :P.